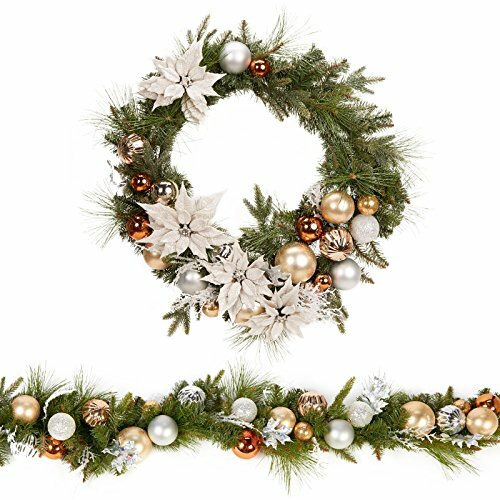 The Metallic Wreath & Garland Set provides an elegant twist on a traditional wreath. Classic ornaments are reimagined and woven into this stunning decor piece that is sure to be the focal point of any setting. Includes: (1) Metallic Wreath and (1) Garland. The Metallic Wreath & Garland Set provides an elegant twist on a traditional wreath. Classic ornaments are reimagined and woven into this stunning decor piece that is sure to be the focal point of any setting. Includes: (1) Metallic Wreath and (1) Garland. Deck the halls with this festive holiday décor! Includes: (1) Metallic Wreath and (1) Garland.